Under the Freedom Tree focuses on the development of Slabtown, created by the thousands of people who left southern slavery to seek refuge in the north thanks to the “enemy property” clause. Children will ask about words like “chattel” and “contraband of war” in reference to people. They will also want to talk about why the three men, Frank, James, Shepard, felt they were seen as “…possessions. Owned and used like cows, pigs, dogs.” In addition, parents should be prepared to discuss why reading and writing were forbidden for some, as teaching under the tree of the book title is discussed. I recommend that before sharing this beautiful book with younger children, parents and caregivers take the time to read the detailed and informative author’s note at the end of the story. The book’s text is in poetic verse, and the author’s note will help those unfamiliar with this piece of Civil War history discuss it with more detail and confidence. Using the painted illustrations, by London Ladd, to discuss emotions and actions mentioned in the text is recommended as well. There is a multi-media website dedicated to Under the Freedom Tree that is interesting and very useful. 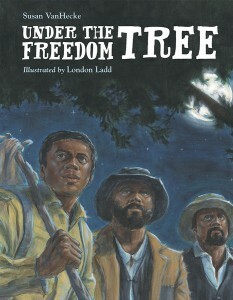 Highly recommended, Under the Freedom Tree will bring an oft overlooked story into focus for children and adults alike. Ages 6-9, although I recommend this book for the older range of that scale and above.